Olympos was an ancient city in Lycia. It was situated in a river valley near the coast. Its ruins are located south of the modern town �?ral? in the Kumluca district of Antalya Province, Turkey. An important Lycian city in the 2nd century BC, Olympos is more famous these days for being the beach resort of choice for backpackers. Staying in an Olympos 'tree house' at one of the dozen-or-so camps that line the 1.5km-long track along the valley down to the ruins and beach has long been the stuff of travel legend. The former hippy-trail hot-spot has gentrified considerably in past years and during summer can be pretty overcrowded and institutionalized. Olympos still offers good value and an up-for-it party atmosphere in a lovely setting. Just remember that 'tree house' is a misnomer; most huts are very firmly on the ground. 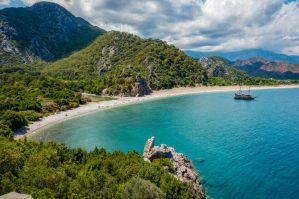 With all of these fabulous attributes, Olympos is a great place to visit, and, there are also some great, budget-friendly accommodations to use as a base for exploring. How much do hostels in Olympos cost? Whether you've been on the road for a while or you're just starting out, Bayrams is the perfect place to chill out. Breakfast and dinner are included for free with your stay. This cozy orange grove is the ideal place to relax in a hammock, play backgammon or enjoy a Turkish water pipe. Just a short walk from Bayrams, the Olympos beach is situated in a picturesque bay in the shadow of Olympos Mountain. Opportunities abound for swimming, rock jumping, kayaking and hiking. And, when you're ready to move on, the on-site travel agency can get you going on a Mediterranean Blue Cruise and help with any travel planning needs. The facility offers a range of accommodation options. The tree house option has single, twin, double, triple and dorm availabilities, all with shared bathroom facilities. For more comfort and style, try one of the private bungalows with attached bath and the added option of air conditioning. They have single, twin, double and triple bungalows available. While you're here, you can explore the nearby ruins of the ancient Lycian city of Olympos. Make sure to also visit the amazing natural phenomenon of the Chimaera flames, which have been burning bright on Olympos Mountain for thousands of years. The facility is open year round and offers activity and travel planning. Breakfast, dinner towels, linens, and parking are included with your stay. Deep Green is located in Olympos Valley, in a large orange garden, surrounded by the natural pine forest. Deep Green offers a calm, peaceful and cheerful social atmosphere with the bar, garden restaurant, hammocks, burning fire, TV room. The property offers a friendly, social atmosphere, tasty traditional food, good music, helpful and friendly staff, buffet service, reasonable priced drinks, fresh tasty cocktails, clean rooms, free wi-fi and much more. Deep Green Bungalows is only 10 minutes' walk far from the magnificent Olympos beach. The bungalows are independent and surrounded by orange trees that makes guests feel more comfortable and relaxed on holiday. Both private bungalows and dormitories are available. Private room rates include breakfast and dinner. Dorm rates do not include meals, but they can be added for a reasonable fee. All rooms have private bathrooms and private rooms have air conditioning. Activity and tour arrangements can be made with the staff for any number of activities in the area. Towels, linens, and parking are free with your stay. Saban Treehouses is the perfect place for either a relaxing break or an adventure holiday. Opened in 1990 they provide quality accommodation to travelers, backpackers and families from all countries. It is situated among the towering pines of the Olympos valley and is a short walk to the pristine Olympos ruins and beach. They offer a range of accommodation to suit all budgets. Ranging from spaciously appointed Bungalows with climate control and ensuite bathroom, Treehouses for those who wish to relive their childhood dreams and even an air-conditioned dormitory for solo travelers. All rates include of breakfast and a magnificent evening buffet dinner prepared in the traditional Turkish village style, utilizing fresh local produce. Whilst in Olympos there are a range of daily activities available, including Sea Kayaking, Canyoning, Scuba Diving, White Water Rafting and Rock Climbing. For those interested in history, The ancient Lycian city of Olympos is close to the property and the fabled never-ending 'Eternal' flames of Chimeara are easily accessible. Linens and parking are free with your stay. 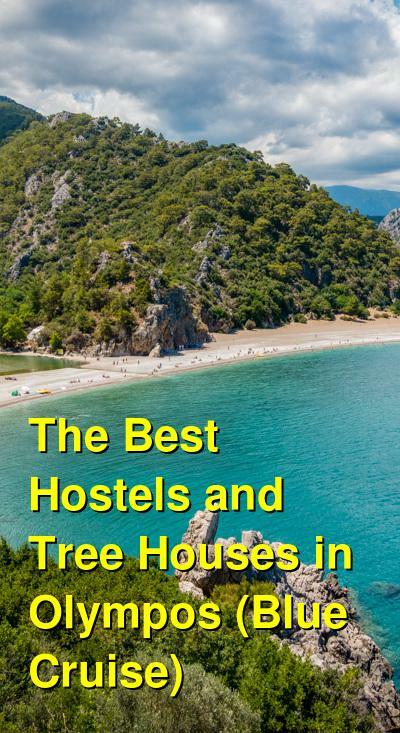 Kadirs Treehouses is located on the Mediterranean coast in southern Turkey. It is surrounded by some of Turkey's most beautiful coastline, ancient ruins, and nature reserves. Kadirs Treehouses can offer a vacation full of fun filled activities from trekking to the Lost City, sea kayaking along the Mediterranean's crystal clear waters, scuba diving, rock climbing, fishing, daily boat trips, cannoning, rafting, mountain biking, Jeep safaris, tours to Chimera (The Eternal Flame), and just relaxing on Olympos' beautiful beach. From this location you can join in with some of the exciting night life in the area. They even have an on-site night club and three bars to keep the party going well into the early hours. Their onsite Pizza House serves a wide range of snack food and drinks, and is open until the last partygoer leaves, ensuring that you will never go hungry. Their accommodations have something to suit everybody. Whether you want to get back to nature at a campsite, or you want to live out every kids dream and live in a real treehouse, or even if you prefer the luxury of air conditioning and ensuite facilities, they have all. The staff are all well-travelled, very knowledgeable about Olympos and the local area, friendly and always ready to help make your stay a memorable experience. English, Russian, German, French, Spanish and of course Turkish are all spoken fluently. They offer a free beach shuttle and are open year round. Breakfast, dinner, linens, and parking are included with your stay. Olympos Orange offers various accommodation choices including bungalows, dorm rooms, cabins, wooden houses. Where nature combines with history and offers great views of the Mediterranean coast which gives the name to the color 'Turquoise' in Turkey. The valley of Olympos opens to the ancient city between the orange gardens and the mystical atmosphere of mythology. Orange is open all year around with all facilities. The facility offers bungalows, shared rooms and wooden houses, restaurant, bar, dancing bar, sports, nature activities, tours and agency services, wireless internet connection, laundry, car park, and more. Find all this and more in a hidden valley in the middle of nature, bursting with history, a place full of fun. The property is 600m from the beach and there are platforms and hammocks in the garden for visitors who want to relax. They also have an Orange Dancing Bar, with a perfect sound and lighting system. It is open till early in the morning for the visitors who wants to enjoy the mystic atmosphere in Olympos. They offer shuttle service, activity planning, and rental car services. Breakfast, linens, and parking are included with your stay.